On December 21, 2012, I published a post on the Très Riches Heures de Jean de France, Duc de Berry, an exquisitely decorated Medieval Book of Hours. Books of Hours are a secular and abridged version of the Liber Usualis, a compendium of Gregorian chants sung during the eight Canonical Hours. The Liber Usualis is rooted in Medieval monasticism, but it had to be restored after the French Revolution (1789-1794) and the Directoire (2 November 1795 until 10 November 1799). 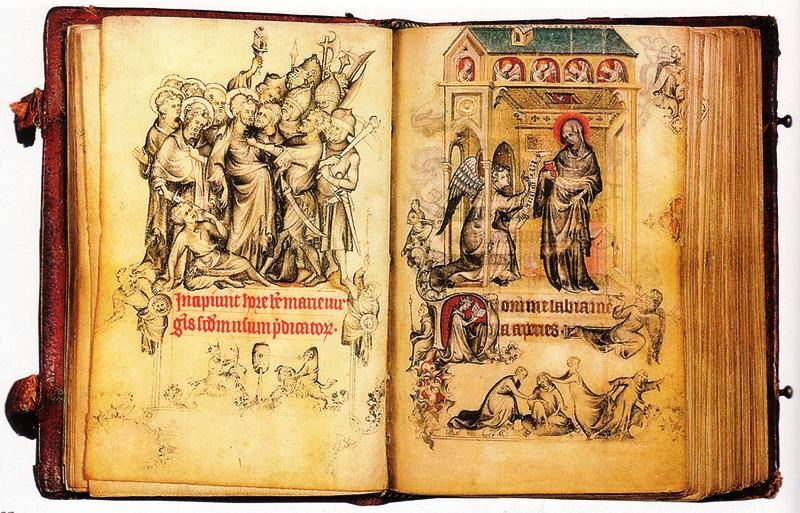 Although used by lay Christians, all Books of Hours, Medieval books, are religious in spirit and reflect a motivation to participate in the liturgy of the hours observed by monks. Yet, Books of Hours differ from the Liber Usualis. They are not decorated. The 1,900-page Liber Usualis, a book of Gregorian Chants, contains the common chants for the Divine Office or the eight Canonical Hours, (the daily prayers of the Church). They also comprise most versions of the Ordinary chants for the Mass (Kyrie, Gloria, Credo, Sanctus, and Agnus Dei). Other than the obligatory content, Books of Hours could include heraldic emblems, coats of arms, information necessary to its owner, genealogical information, etc. Because they are shorter than the Liber usualis, Books of Hours leave room for enluminures (illuminations) and fine calligraphy, the main artistic elements of Jean de France’s “Très Riches Heures” and other luxury Books of Hours. Enluminures were miniature paintings designed to reproduce the luminosity of stained glass. So not only did Books of Hours include liturgical, devotional and personal contents, but they are also works of art. It is mainly as works of art that they have come down to us. 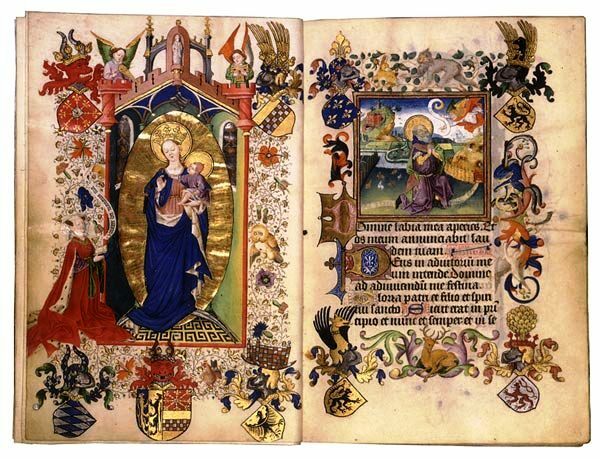 Illuminated pages of Books of Hours were genuine miniature paintings and were not bound, at least not originally. They were independent folios bound at a later date. Illuminations could be extremely costly, depending on their sophistication, the time required to illuminate the text, the pigments and other materials used to make the colours, the “paper” on which the artist(s) created his or her illuminations and, of great importance, the skills of the scribe. Let us look at the paint and the paper artists used. Moreover, Books of Hours are associated to the history of paper. Now the history of paper finds its origins at an earlier date. Egyptian papyrus was manufactured in the 3rd millennium BC. In the case of Medieval Books of Hours, however, one used parchment (parchemin), a writing membrane made from the skin of sheep, goats, or calves. The finest paper was vellum (from the old French vélin, “calfskin”). Where calligraphy is concerned, Books of Hours are an important step in the history of printing, as are illuminations, our illustrations. In calligraphy, we find the ancestors to our fonts. Accomplished scribes wrote so beautifully that the calligraphy of Books of Hours was a work of art in itself. Excellent scribes seldom made mistakes and, for the fifty or so years that followed the invention of printing, printers left room for illuminations to be inserted and, in particular, for initials to be rubricated (red) rather than “historiated.” These books are called incunables. 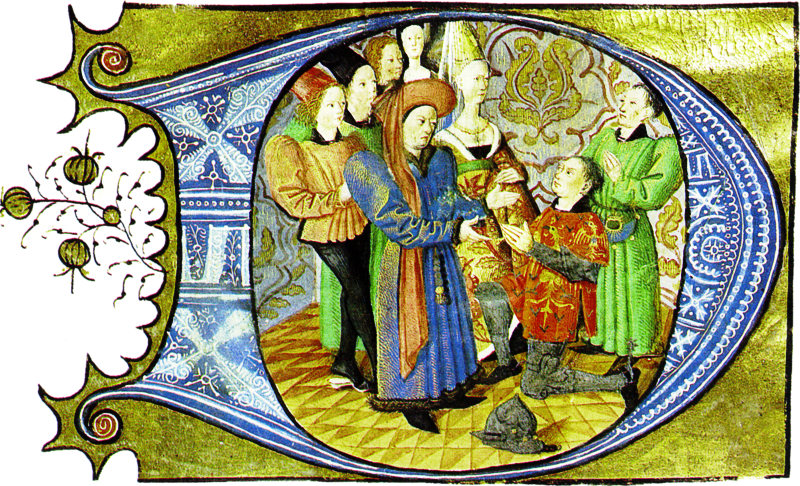 The historiated “D,” to your left, shows Charles d’Orléans (24 November 1394, Paris – 5 January 1465, Amboise) receiving homage from a subject. Painting historiated letters must have been a true challenge to miniaturists as the letters were a miniature within a miniature. Some miniaturists used a lens. Books of Hours were a collaborative project. The above-mentioned Hours of Catherine of Cleves (c. 1440), offered to her as a wedding present, is an example of a luxury book of hours. Catherine’s horæ, the Latin word for “hours,” are decorated with 158 colorful and gilded illuminations. (“Hours of Catherine of Cleves,” Wikipedia.) Miniaturists therefore spent several years preparing her wedding present. They also spent years producing the Hours of Jeanne d’Évreux, Queen of France, c. 1324–28, by Jean Pucelle (French, active in Paris, 1319–1334). Catherine’s hours are housed in the Cloisters at the Metropolitan Museum of Art, N. Y. It contains twenty-five full-page miniatures and approximately seven hundred smaller enluminures and was first bought by Jean de France, Duc de Berry. However, less affluent and, at times, poor Christians, including servants, also owned a Book of Hours. Tens of thousands Books of Hours were made. Thousands are still available. These may have had a few illuminated pages and may have been manuscripts, but the humbler Books of Hours were seldom the products of great artists. Moreover, some were printed, but occasionally the printer left spaces that could be hand coloured. These were the incunables. Books of Hours also have “pagan” roots. They were Horæ in Latin Antiquity, a word still used in the Middle Ages, and were inspired by the cycle of nature, the degree of light and darkness,[ii] and the appropriate Labours of the Months. As I mentioned in a recent post, Candlemas: its Stories & its Songs, Greek Poet Hesiod, who is believe to have been active between 750 and 650 BCE, wrote a Works and Days that Wikipedia describes as a farmer’s almanach. In this respect, Jean de France’s Très Riches Heures de Jean de France, Duc de Berry resembles Hesiod’s Works and Days. The Très Riches Heures feature a monthly page consisting of a full-page painting and a page featuring an image, above which there is a semicircle that shows the twelve signs of the Zodiac as well as the ecclesiastical lunar calendar, full moon and new moon, yet another manner in which Books of Hours predate Christianity. As calendars, Books of Hours span civilizations, but may not contain illuminations and fine calligraphy. In short, Medieval Books of Hours are a very rich legacy rooted in the Liber Usualis and in seasons forever new. However, this does not preclude a resemblance with Latin horæ and borrowings, some from a more distant past. Pictures predate Christianity as do calendars, almanacs, labours of the months: seasons. In this regard, Books of Hours can be linked to earlier works. They also constitute a step in the history of printing and a history of books. I must close here, but our next step is a glance at illuminated manuscripts that are not Books of Hours. Under “Sources” below, I have mentioned Psalters. But, among illuminated books, there were Gospel Books, Responsorials, Antiphonaires, Missals, Apocalyptic books, Breviaries, hagiographic books (lives of saints) and other illuminated manuscripts. In an earlier post, I wrote about the Fitzwilliam Book of Hours. This post is one of the related articles listed at the end of the current post. It shoud be updated. For instance, it requires embedded videos. This post is one of the related articles listed at the end of the current post. It should be updated. For instance, it requires embedded videos. [i] “Book of Hours.” Wikipedia. [ii] Their foremost common denominator.